Our Creating Options Together™ Conference is going to happen again! The conference will take place August 2-5, 2016 — with partners from the 25 cities where we're ministering already, plus another 100 partners from major cities where we're not yet established. This will make for a dynamic conference. We'll plant an even greater vision for a church-led movement to lift up Christ in cities across America and beyond. Poverty has been defined as a lack of options. 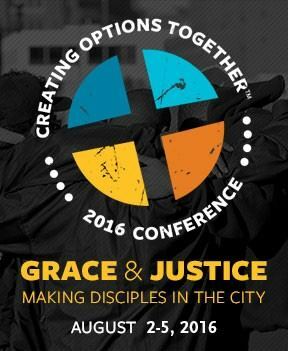 Together, we will create fresh options for building Christ-centered disciples in the city. We'll work to address practical and spiritual needs. We pray that every participant will leave this conference with a diverse spectrum of resources that reflect the grace and justice of the gospel. Our aim is to help participants broaden their ministries, recruit more new partners, and expand the Circle of Hope. This historic conference could truly shake the foundations of the Church for generations to come. But we need your help in this. Here's why: There are inner-city partners who WANT and NEED to be at this conference, yet simply can't afford to get here. We're asking every participant to pay their own way to get to the conference. We're also asking them to cover the cost of their own meals, lodging, and conference materials. But some of these urban heroes of the faith — people who are giving their very lives to serve among the poor — literally do not have the funds. We don't want to embarrass anyone, but let us tell you about someone we'll call "David." He pastors a church in a poor Brooklyn neighborhood devastated by Hurricane Sandy. The church was the only building with electricity, so neighbors came there for shelter after the storm. God used that storm. The congregation began growing in numbers. It has doubled in size just since Christmas! Pastor David is a fast learner. He's highly motivated. And he needs to be at our conference, to expand his capacity to seize the God-given opportunity in this neighborhood. But this is a man who left his job in business to serve the poor full-time. His entire staff is made up of volunteers, many of them new Christians. We can't ask him to come up with $395 for materials, meals, and lodging, in addition to his transportation costs. So we’re praying that you will help us provide scholarships for dedicated servant-leaders like David. Sponsor an urban hero for the full conference. Or sponsor one for just one day. Or give whatever you can. Please let us hear from you. Plans are underway. Thank you for understanding. P.S. Our inner-city newsletter, called Creating Options Together®, will remind you that our God is a God of redemption, renewal, and hope. To receive our bi-monthly e-newsletter, please click here.